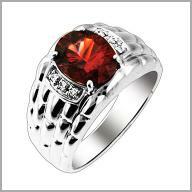 Crafted from 14K white gold, this ring displays one oval cut 9x7mm rhodolite in four prong setting. A polished, links design shank is accented with 6 round full cut diamonds in beads settings. The rhodolite weighs 2.8500ct and the total dismond weight is 0.06ct (both approximate). The ring measures 11/16"L x 7/16"W x 5/16"H.